These light bites made with smoked salmon and a yogurt dill topping are the perfect appetizer before a big meal or for a New Year's Eve party. Greek yogurt provides a creamy, light texture while dill provides a fresh flavor and antioxidants. 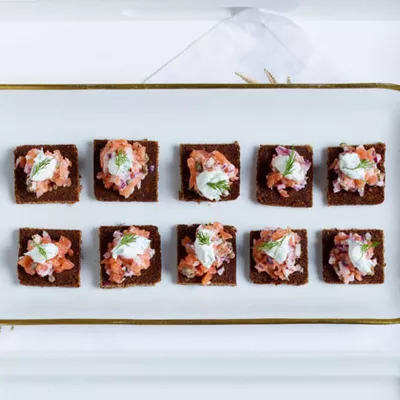 These light bites made with smoked salmon and a yogurt dill topping are the perfect appetizer before a big meal or for a New Year's Eve party. Greek yogurt provides a creamy, light texture while dill provides a fresh flavor and antioxidants. And this recipe is easy to make. Just combine the salmon, onion, chives, capers, mayonnaise, lemon juice, and pepper in a medium bowl. In a separate bowl, combine the yogurt, dill, remaining lemon juice, and pepper. Refrigerate the mixtures until ready to serve. Then spread a tablespoon of the salmon mixture onto each of the pumpernickel squares, and top with a teaspoon of the dilled yogurt. Top with dill and serve. Enjoy two bites for 103 calories.